GEDB is a research programme of the Royal Swedish Academy of Sciences - an independent organisation whose overall objective is to promote the sciences and strengthen their influence in society. The GEDB programme is funded by The Erling-Persson Family Foundation. GEDB has a wide network of collaborators, national and international. Two key national partners are the Stockholm Resilience Center and the Beijer Institute of Ecological Economics. The Beijer Institute of Ecological Economics is an international research institute under the auspices of the Royal Swedish Academy of Sciences. Humanity is embedded in the Biosphere and shapes it from local to global scales, from the past to the future. At the same time humanity is fundamentally dependent on the capacity of the biosphere to sustain development. With this overall perspective, the major objectives of the Beijer Institute are to carry out research and stimulate cooperation to promote a deeper understanding of the interplay between ecological systems and social and economic development. Stockholm Resilience Centre advances research on the governance of social-ecological systems with a special emphasis on resilience - the ability to deal with change and continue to develop. The vision of the Stockholm Resilience Centre is a world where social-ecological systems are understood, governed and managed, to enhance human well-being and the capacity to deal with complexity and change, for the sustainable co-evolution of human civilizations with the biosphere. The Nereus Programme. A global interdisciplinary initiative between the Nippon Foundation and the University of British Columbia that was created to further knowledge of how best to attain sustainability for the world’s oceans.GEDB and Nereus collaborates on on issues of marine fisheries and trade dynamics. UNEP Finance Initiative, and UNEP Inquiry into the Design of a Sustainable Financial System. Both organisations are members of the funded Vinnova proposal to extend the Earth System Finance work stream during 2017. Sustainable Fisheries Partnership. 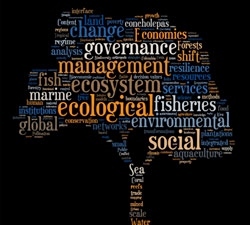 An ongoing collaboration to evaluate data on Fisheries Improvement Projects, to understand which supply chain strategies lead to more sustainable use of marine resources in specifi c cultural/political contexts. proposal on Earth System Finance. ReAct. A global network dedicated to the problem of antibiotic resistance. Members have backgrounds ranging from global health, microbiology and healthcare professionals to journalists and communication experts. Collaborations are being initiated to introduce biosphere-literate approaches for dealing with the issue of antibiotic resistance. Early Career Researchers Network of Networks. GEDB is (through Søgaard Jørgensen) part of the executive committee of a new international effort to connect early career researchers across 17 early career researcher networks, in collaboration with Future Earth. Report launch: Sleeping financial giants?